Dogwidgets® DW-4 Rechargeable 2 dogs training vibration collar by Dogwidgets. Collars has 3 levels of vibration and has 600 feet range. You can individually vibrate your dog or vibrate them both at the same time. Collar will work with dogs from 15 to 100 pounds. Use this collar for basic training, jumping on people, chasing cars and barking. 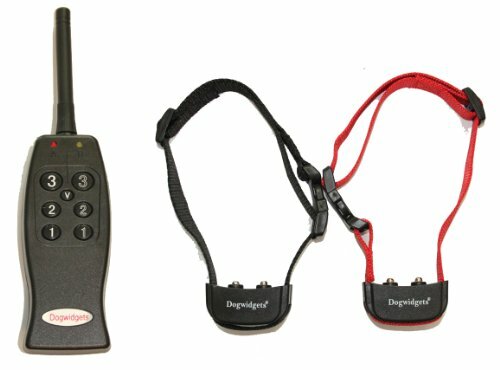 The set contains: 1 remote control(9-volt battery operated), 2 rechargeable collars, 2 straps adjustable from 12 to 20 inches long and 6 months warranty from Dogwidgets. Rechargeable collars. Will work with dogs from 15 to 100 pounds. If you have any questions about this product by Dogwidgets, contact us by completing and submitting the form below. If you are looking for a specif part number, please include it with your message.